Yesterday, was a better news day for new trains, with articles with these headlines. All are significant for passengers. The authorisation of the Class 710 trains is particular importance to me, as they will be running locally to where I live. It will be a couple of months before they enter passenger service. But the trains have mainly been delayed by software problems and now that appears to have been fixed and as there are twenty trains already built, I could see them entering service, as soon as drivers have been trained. It should be noted that eight trains are needed for the Gospel Oak to Barking Line and six for the Watford DC Line, so if twenty have been built, I would expect that these two routes could be converted to the new trains by the summer. LNER’s Class 801 trains will be a significant introduction, as they will enable the cascade of the Mark 4 coaches to other operators, like Trains for Wales and East Midlands Railway. On Friday, I took a train between Moorgate and Essex Road stations. It was not in bad condition. These trains are three-car trains and run in pairs as six-cars. These trains used to run on the Watford DC Line, so I wonder if when they get to be released by the new Class 717 trains, some could be put back on that line to release some more Class 378 trains for the Gospel Oak to Barking Line. Anybody like a game of Musical Trains? In the article, there is a picture of 378232 at Barking station. So is it a spare train, that is used for driver and staff training and route proving? It was certainly doing the latter at Barking. This page on the Barking-Gospel Oak Rail User Group web site is their latest newsletter, which was issued on the 14th of January. These are the headlines on the newsletter. Trains that work are urgently needed to replace the diesel Class 172 trains, which will all leave by the end of April or even March. These types of trains have been touted as replacement trains. TfL has started to send some Class 315 trains, made redundant by TfL Rail, for scrapping. Could some of these be held back for use on the Gospel Oak to Barking Line? They should fit the route. London Overground already runs these trains to Cheshunt, Chingford and Enfield Town. The expertise and driving experience must be there to run a service. But, as there have been no reports of any Class 315 trains on the route, I suspect that there’s a reason, why these trains can’t fill the gap. Could it be the disability regulations, which kick in at the end of 2019? The proposed Class 710 rains ordered for both Gospel Oak to Barking Line and the Watford DC Line are dual voltage. 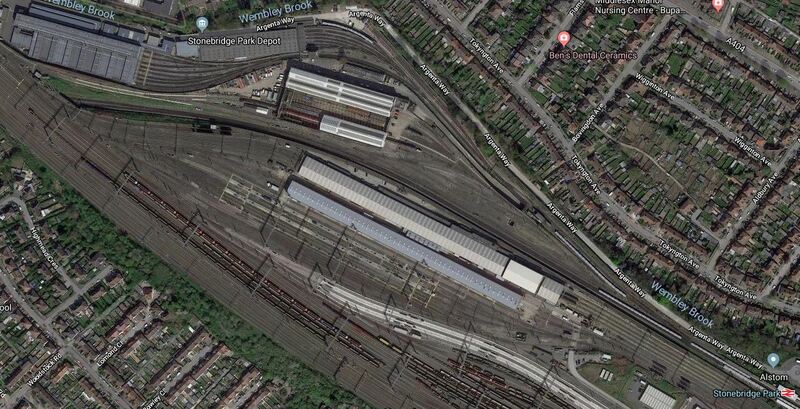 As the Willesden TMD was built to handle trains with the ability to use third-rail electrification, is this ability needed to access the depot? But Class 315 trains are 25 KVAC only, so this could mean they are unsuitable. Class 365 trains got ScotRail out of trouble, but like the Class 315 trains, they are 25 KVAC only, so may have the same stabling issues. They would also be a new train class for London Overground. 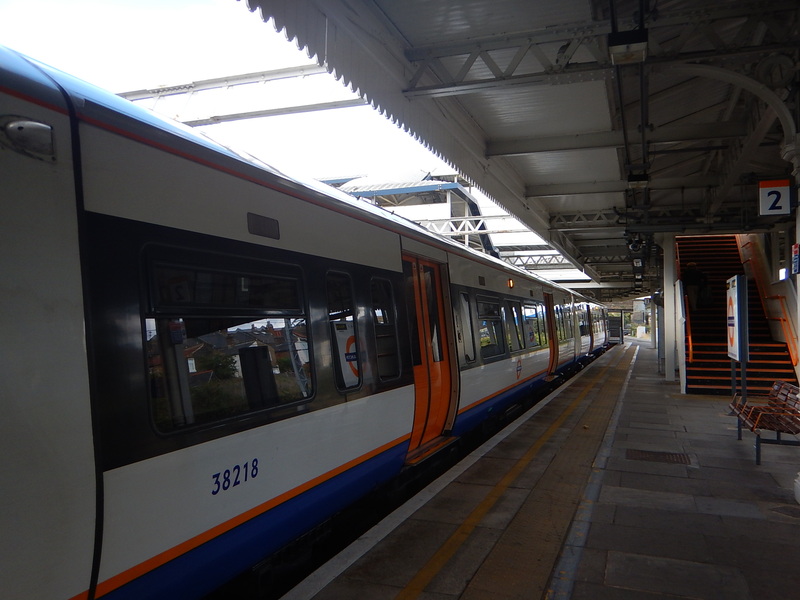 Class 319 trains are dual-voltage and could probably be used on both routes, but they would need a refurbishment and would also be a new train class for London Overground. Class 378 trains already work the Watford DC Line and after the test of a four-car unit to Barking, London Overground probably know how difficult, it would be for four-car trains to work the route. The trains are dual-voltage and London Overground’s strategy of basing trains for both routes at Willesden TMD would probably be possible. Drivers and other staff know them very well, as do the passengers. I am drawn to the conclusion, that of the trains available in the event of non-delivery of Class 710 trains, the Class 378 trains are the best choice. How Many Trains Are Needed For The Gospel Oak To Barking Line? The full service was run by a fleet of eight Class 172 service. As the same number of Class 710 trains have been pencilled in for the route, I must assume that this is the number of trains required. I think six trains are needed for the service, with two in reserve or maintenance. How Many Class 378 Trains Are Needed For A Full Overground Service? If I go through the routes of the original Overground, I find the following. Trains take 46 minutes to go South and 44 minutes to come North and a round trip would take two hours. This means thatthe current four trains per hour (tph) service would need eight trains. Trains take 22 minutes both ways and a round trip would take an hour. This means that the current four tph service would need four trains. Trains take 44 minutes to go South and 43 minutes to come North and a round trip would take two hours. This means that the current four tph service would need eight trains. Trains take 52 minutes both ways and a round trip would take two hours. Trains take 47 minutes to go South and 50 minutes to come North and a round trip would take two hours. This means that the current three tph service would need six trains. Between Stratford and Richmond, trains take 59-64 minutes to go West and 62 minutes to come East. Between Stratford and Clapham Junction, trains take 62 minutes to go West and 64 minutes to come East. The round trip times are very similar and are around two and a half hours. This means that the current eight tph service would need twenty trains. This gives a total of 54 trains. As there are fifty-seven Class 378 trains, this means there are three spares to cope for maintenance and breakdowns. London Overground have plans to increase frequencies and they are detailed in this table. Note that four extra services are planned for the East London, North London and Watford DC Lines. Two extra tph between Stratford and Clapham Junction, which has already been implemented. Two extra tph between Dalston Junction and Clapham Junction. This would mean that twelve trains would be needed for this service. Two extra tph between Dalston Junction and Crystal Palace. This would mean that twelve trains would be needed for this service. One extra tph between Euston and Watford Junction. This would mean that eight trains would be needed for this service. This gives a total of 64 trains. As London Overground only has 57 Class 378 trains, this proposed timetable is impossible without some new Class 710 trains. London Overground plan to use some of the Class 710 trains to release Class 378 trains from the Watford DC Line, to reinforce East London Line services. So it looks like the late delivery of the Class 710 trains has also scuppered London Overground’s plans to increase services on the East London Line. How Many Class 378 Trains Could Be Scraped Together? This table shows the number of Class 378 trains needed for the current service. This gives a total of 54 trains. With just three trains spare. As the Gospel Oak to Barking Line needs eight trains to run a full service, this is not enough. What strategies can be applied to increase the number of trains available? The Stratford and Clapham Junction service was two tph until recently, when it was raised to four tph. Reducing it back to two tph, would reduce the number of trains required on Stratford and Clapham/Richmond services by five. This would give eight spare trains, which would be almost enough to run a full service on the Gospel Oak to Barking Line. Provided of course, that there was a hundred percent availability, which is rather an impossible dream. The Class 710 trains for the Gospel Oak to Barking Line are dual-voltage trains, which will also run on the Watford DC Line. So would it be a sensible idea to introduce these trains first on the Watford DC Line? The third-rail electrification on the line is at least fifty years old, so must be fully tested. The drivers have extensive route knowledge of running electric trains on the route. Willesden TMD, where the Class 710 trains are stabled, is on the Watford DC Line. The route is only shared with the Bakerloo Line. The route is to be equipped with six Class 710 trains anyway. Every Class 710 train introduced will release a Class 378 train. But if the Class 710 trains don’t work, this is no help! Running on the North London Line is more complicated than the Watford DC Line, but five-car Class 710 trains, are planned for this route. They could be introduced to release Class 378 trains. Every four-car train created means that a trailer car is removed from a five-car Class 378 train. I would assume that it is most likely, these spare cars will be put into store until the, the new Class 710 trains finally enter service. Or would they be added to other Class 378 trains to create six-car trains, which would then be run on the North or West London Lines, where the platforms could be almost long enough? Selective door opening on the trains could also be used at short platforms. I feel if the London Overground swap trains around and perhaps reduce the Stratford and Clapham Junction service to its old level of 2 tph, then enough Class 378 trains would be available to run a full four-car service on the Gospel Oak to Barking Line. Will The Extended Bakerloo Line Be Twenty-Seven Trains Per Hour All The Way? There are two major projects that will be implemented on the Bakerloo Line in the next decade or two. The replacement of the current 1972 Stock trains with the New Tubes for London. The extension of the line to Lewisham station. Under Current And Future Infrastructure, the Wikipedia entry for the Bakerloo Line says this. Transport for London proposes to upgrade the line eventually, but not until other deep-level lines have been dealt with. This will include new signalling and new trains, enabling a maximum frequency of 27 trains per hour. TfL currently expects these to be in place by 2033. Twenty-seven trains per hour (tph) seems very much in line with other deep-level Underground Lines. Piccadilly Line – 33 tph after upgrade. Perhaps, it is a bit lower, but the engineers usually manage to squeeze more out of a line. 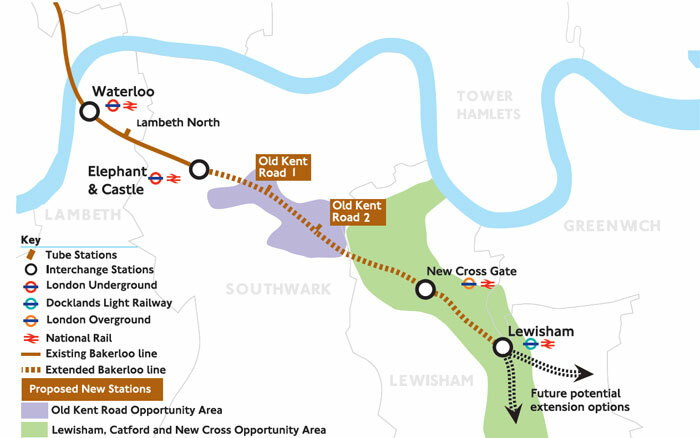 The planning is underway to extend the Bakerloo Line to Lewisham station. The Bakerloo Line Extension looks like it will be a four-station extension, with interchanges at Elephant & Castle, New Cross and Lewisham. This map from Transport for London, shows the extension. I think it will be highly likely, that the extension will be built using a similar design and techniques to that of the Northern Line Extension to Battersea. There are unlikely to be any junctions. The Lewisham station will have two platforms with overrun tunnels. There appears to be no depot planned. I have come to some conclusions about the design. If the track layout of the extension and particularly at Lewisham follows the layouts of the Victoria Line termini, I can see no reason, why the proposed frequency of twenty-seven tph can’t be achieved. I also suspect that provision will be made, so that the frequency can be increased. A higher frequency would also be expected if the Bakerloo line, were to be further extended to two separate branches, as the map indicates. I suspect that for the extension to work in an optimum manner new trains will be needed. The Northern Line Extension to Battersea appears to be taking about six years from sign-off to completion. This extension is twice as long and has double the number of stations, but is probably not as grand. I would put my money on a seven year project and a couple of billion. As it is unlikely, that the required new trains will not be available until 2033, the project probably has a sign-off date of around 2025. The project could be pulled forward. The trains could be built after those for the Piccadilly Line. An early decision could be made. Saying go in 2022 would enable a finish in 2029. North of Queens Park station, the line is double-track all the way to Watford Junction station. At Queens Park station itself, it’s a lot more complicated. This map from carto.metro.free.fr shows the track layout at Queens Park station. 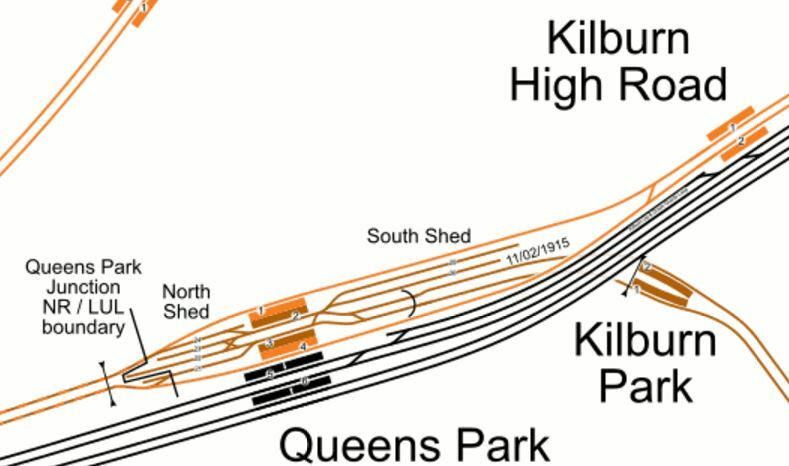 The Watford DC Line of the Overground is shown in orange and runs through Kilburn High Road and Queens Park stations. The Bakerloo Line is shown in brown and runs through Kilburn Park and Queens Park stations. 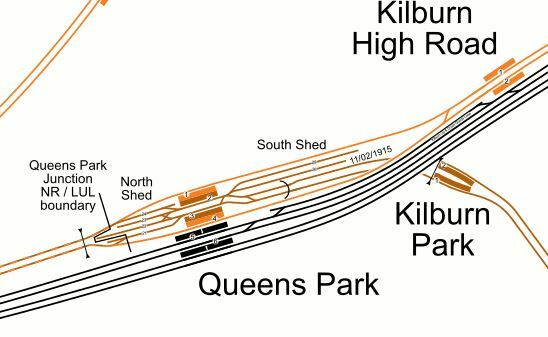 There are reversing sidings to the West of Queens Park station for the Bakerloo Line. The following services go through or terminate at Queens Park station. Three tph between Euston and Watford Junction on the London Overground. Six tph between Harrow & Wealdstone and Elephant & Castle on the Bakerloo Line. Three tph between Stonebridge Park and Elephant & Castle on the Bakerloo Line. Eleven tph between Queens Park and Elephant & Castle on the Bakerloo Line. It is also likely that the Overground service will go to four tph. So this means that services will be as follows. Four tph on the Watford DC Line run through Kilburn High Road station. Twenty tph on the Bakerloo Line run through Kilburn Park station. Nine tph on the Bakerloo Line run through Queens Park station. Four tph on the Watford DC Line run through Queens Park station. Eleven tph on the Bakerloo Line terminate at Queens Park station. Thirteen tph will continue to various destinations towards Watford Junction. What Is The Capacity North Of Queens Park Station? So how many trains could the double-track line between Queens Park and Wartford Junction stations handle? All services on the line are london Overground or London Underground. There are no junctions, where services divide and join. There is a turnback facility at Harrow & Wealdstone station, that can handle six tph. The Overground trains are being replaced with Class 710 trains, which must be able to be made compatible with digital signalling. Watford Junction station has four platforms connected to the Watford DC Line. Good design should be able to make the stations step-free for both Class 710 trains and New Tube for London. The Watford DC Line service, always seems to terminate in platform 9 at Euston. London Underground have run thirty-six tph on the Victoria Line for about a year now. I suspect that if the trains are digitally signalled, with a degree of Automatic Train Control, that there could be as many as thirty-six tph between Queens Park and Watford Junction stations. I also think it is significant that the New Tube for London, specifies that the Bakerloo Line will run at twenty-seven tph. Why not more, if the theoretical capacity North of Queens Park is thirty-six tph? But a single platform at Euston can probably handle six tph, so add 27 and 6 and you get thirty-three tph, which is the proposed core frequency of the Piccadilly Line. Will The Bakerloo Line Run All The Way To Watford Junction? Suppose too, that all Bakerloo services ran all the way to Watford Junction, as has been proposed in the past. This would simplify operation and especially at Queens Park, Stonebridge Park and Harrow & Wealdstone stations. Digital signalling would easily handle the frequency. 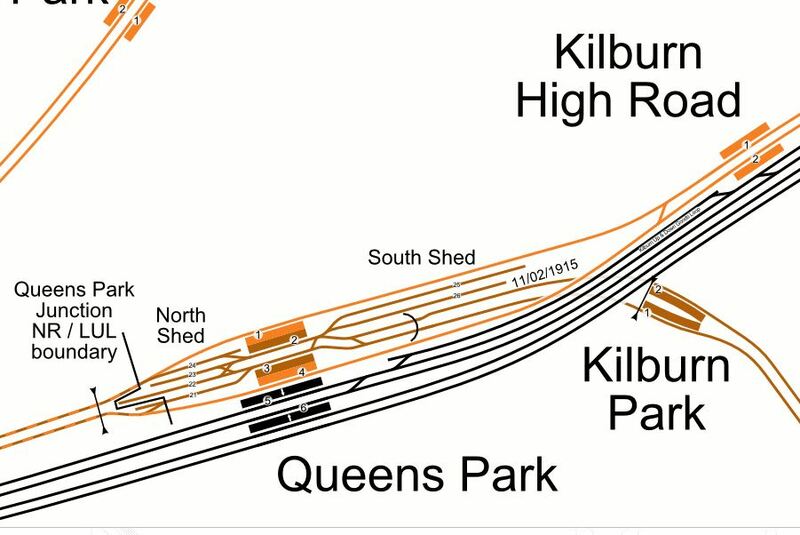 The platform arrangement at Queens Park would be unchanged, with Euston services on the outside and Bakerloo services in the middle. Watford Junction would have superb thirty-three tph service to two destinations in London. Will The New Tube for London Run The Euston Service? I will speculate, that the Watford DC Line service could be run by New Tubes for London..
One type of train would be easier to handle for staff and passengers. All platform heights could be the same. All services would be step-free between train and platform. Digital signalling could easily handle thirty-three tph along the shared route. In Thoughts On The Power System For The New Tube for London, I proposed that the New Tube for London could run on a conventional third-rail system. This would further mean the following for the Bakerloo Line. New Tubes for London could use the existing track to access Euston, without serious modification. If the Bakerloo Line is extended to Hayes, Beckenham Junction or Bromley North stations, the existing tracks could continue to handle existing third-rail trains to provide other services. Only one type of train would be needed to run all services on the Bakerloo Line to its various destinations. Use of New Tubes for London on all routes may be possible to create a service on the Northern section of the Bakerloo Line with the following characteristics. Twenty-seven tph between Watford Junction and Elephant & Castle stations. Six tph between Watford Junction and Euston stations. All stations would be step-free between platform and train. All trains would be identical New Tubes for London. All trains would run under Automatic Train Control, as does the Victoria Line. All passengers on the existing Bakerloo and Watford DC Lines would see a better service. Note, that I have said nothing about the Bakerloo Extension to Lewisham. In my view, that extension does what it says on the tin and creates a new twenty-seven tph service between Elephant & Castle and Lewisham stations, which brings new services to an area of South-East London, where they are much needed. Effectively, the Bakerloo Line would become two twenty-seven tph lines, that happen to connect back-to-back at Elephant & Castle station to enable cross-London journeys. Could Bakerloo Line Services Still Be Turned Back At Harrow & Wealdstone? The following could be argued. Watford Junction doesn’t need twenty-seven tph on the Bakerloo Line and six tph to Euston. Watford needs a cross-Watford service like the in-limbo Croxley Rail Link. So could a few trains be turned back using the existing facility at Harrow & Wealdston station to create paths to allow an appropriate service between say Watford Junction and Amersham stations? If we look at the Victoria Line, where the frequency has increased over the last few years by the addition of various improvements, I would not be surprised to see the frequency of twenty-seven tph increased. After all London Underground’s engineers have been squeezing Dear Old Vicky for half a century, so they must know more tricks, than Paul Daniels knew at the peak of his success. Undoubtedly, the New Tube for London could run at twenty-seven tph all the way between Watford Junction to Lewisham stations. Whether that frequency is needed all the way is another matter. I shall start by looking at the current and future capacity of various rail routes across London. The Bakerloo Line has a frequency of twenty trains per hour (tph) between Queen’s Park and Elephant & Castle stations. The current 1972 Stock trains have a capacity of 700 passengers. This gives a capacity a 14,000 passengers per hour (pph) in each direction. In the Wikipedia entry for the New Tube for London, this is said. Bakerloo line capacity could be increased by 25% with 27 trains per hour at peak times by 2033. This gives a future capacity of 17,500 pph in each direction. The Central Line has a frequency of thirty-five tph between White City and Leytonstone stations. The current 1992 Stock trains have a capacity of 930 passengers. This gives a capacity a 32,550 pph in each direction. Central line capacity increased by 25% with 33 trains per hour at peak times by 2030. This gives a future capacity of 40,687 pph in each direction. Crossrail is planned at present to have twenty-four tph between Paddington and Whitechapel stations. Each of Crossrail’s Class 345 trains can hold 1,500 passengers. This gives a capacity a 36,000 pph in each direction. It has been said in several places that Crossrail has a future frequency of thirty tph. If this could be achieved this would increase capacity to 45,000 pph in each direction. The District Line has a combined frequency with the Circle Line of twenty-four tph between Gloucester Road and Tower Hill stations. The current S7 Stock trains have a capacity of 865 passengers. This gives a combined capacity a 20,760 pph in each direction. The Wikipedia entry for the District Line talks about a future frequency of thirty-two tph. This could increase the future capacity to 27,680 pph in each direction. The East London Line has a frequency of sixteen tph between Dalston Junction and Surrey Quays stations. The current Class 378 trains have a capacity of 840 passengers. This gives a capacity of 13,440 pph in each direction. London Overground are planning to increase the frequency to twenty tph in the next couple of years. This would give an increased capacity if 16,800 pph in each direction. The current Class 172 trains have a capacity of 120 seats, with perhaps a total capacity of 300. This would give a capacity of 1,200 pph in each direction. The new Class 710 trains have a capacity around 700, according to various reports. This would give a future capacity if 2,800 pph in each direction. The Hammersmith & City Line has a combined frequency with the Circle Line of twelve tph between Paddington and Liverpool Street stations. The current S7 Stock trains have a capacity of 865. This gives a combined capacity of 10,380 pph in each direction. The Jubilee Line has a frequency of thirty tph between North Greenwich and Willesden Green stations. The current 1996 Stock trains have a capacity of 875 passengers. This gives a capacity of 26,250 pph in each direction. With Siemens new trains, I suspect that this value could be increased by perhaps fifteen percent to 30,187 pph in each direction. The Metropolitan Line has an Off Peak frequency of sixteen tph between Baker Street and Liverpool Street stations. The current S8 Stock trains have a capacity of 1003. This gives a combined capacity a 16.048 pph in each direction. With the Metropolitan Line Upgrade, we can probably see some more capacity. A not unreasonable twenty percent would raise the future capacity to 19,257 pph in each direction. In the Peak both branches of the Northern Line have a frequency of twenty-four tph between Camden Town and Kennington stations. This is reduced to twenty tph in the Off Peak. With the addition of the Extension to Battersea, these figures are unlikely to get lower. The current 1195 Stock trains have a capacity of 662 passengers. This gives a capacity of 31,776 pph in each direction. With Siemens new trains, I suspect that this value could be increased by perhaps fifteen percent to 36,542 pph in each direction. The North London Line has a frequency of eight tph between Willesden Junction and Stratford stations. This gives a capacity a 6,720 pph in each direction. London Overground are possibly planning to increase the frequency to twelve tph in the next couple of years. This would give an increased capacity if 10,080 pph in each direction. As we don’t know the capacity of the new Siemens trains, this is a best estimate, for when they are in service around 2023-2025. Currently, the Piccadilly Line is running at a frequency of twenty-four tph between Barons Court and Arnos Grove stations. The current 1973 Stock trains, each have a capacity of 684 passengers. This gives a current capacity of 15,416 pph in each direction. Piccadilly line capacity could be increased by 60% with 33 trains per hour at peak times by 2025. This gives a 2025 capacity of 24,666 pph in each direction. Dividing the 24,666 by 33 gives a train capacity of 750 passengers for a New Tube for London. Thameslink will have a frequency of twenty-four tph between St. Pancras and Blackfriars stations. Half of these will be twelve-car Class 700 trains with a capacity of 1754 and the other half will be eight-car trains with a capacity of 1146. This gives a capacity of 34,800 pph in each direction. It has been stated that Thameslink will be able to handle thirty tph in the future, which would raise the capacity to 43,500 pph in each direction. The Victoria Line is currently running at a frequency of thirty-six tph. The current 2009 Stock trains, each have a capacity of 876 passengers. This gives a capacity of 31,536 pph in each direction. I think it is reasonable to assume that the Victoria Line is at capacity. But I wouldn’t be surprised, that with station improvements, which would include a double-ended Walthamstow Central station, engineers on Dear Old Vicky managed to squeeze forty tph out of the old girl. This would give a capacity of 35,040 pph in each direction. I also wouldn’t rule out replacing the current trains with the New Tube for London, if the new trains have proved an outstanding success on all the other lines. But that probably wouldn’t be to well into the 2030s. The current figures in passengers per hour can be summarised as follows. Reasonable projections for future figures can be summarised as follows. Or a capacity increase of around twenty-three percent. What Do These Figures Show? My figures are very much rough estimates, based on what is proposed to happen. Five of the improvements in capacity require the replacement of the current trains with the New Tube for London. Three of these replacements will need new signalling and only the Piccadilly Line trains have actually been given the go-ahead. If these train replacements and signalling are done sequentially, they would show these overall capacity improvements. Some of these figures may appear small, compared to the Piccadilly and Central, but then with the exception of the Bakerloo, the other lines already have Automatic Train Control and high-frequency services. The great thing about the effects of the New Tube for London on capacity, is that it is a rolling program and as each line is converted, more capacity will continue to be added, benefiting many parts of London. Increasingly, lines in London are digitally-signalled with a degree of Automatic Train Control. In a few years time, these lines will be controlled this way in Central London. All these lines are or will be carriers of high numbers of passengers. In A North London Line With Digital Signalling, I looked at the benefits of installing digital signalling on the North London Line. This was my conclusion. It looks to me, that they’ll come a time, when digital signalling to squeeze the required number of trains along the North London Line. Digital signalling will have to be applied to all the other lines in my list to make the most of the train lines we have in London. Of the deep level Underground lines, the Bakerloo Line is well below the capacity in passengers per hour (pph) of the other lines, through Central London. The easiest way to increase the capacity would be to increase the frequency of the trains, by the application of digital signalling. Earlier in the section on the Piccadilly Line, I calculated the capacity of each New Tube for London on that line as 750. So if the Bakerloo Line could handle the thirty-six tph currently running on the Victoria Line, this would give a capacity of 23,333 pph in each direction. Like the Victoria Line, the Bakerloo is a simple double-track without junctions through Central London. At the Southern end the line terminates in the two platforms at Elephant & Castle station. If Brixton and Walthamstow Central stations can handle thirty-six tph, then surely with modern trains and digital signalling, this number of trains can be handled at Elephant & Castle station. But at Queen’s Park station, it’s more difficult. This map from carto.metro.free.fr shows the track layou at Queens Park station. Eleven tph between qQueens Park and Elephant & Castle on the Bakerloo Line. Thirteen tph will continue to various destinations towards Watford. But a single platform at Euston can probably handle six tph, so add 27 and 6 and you get 33 tph, which is the proposed core frequency of the Piccadilly Line. Suppose too, that all Bakerloo services ran all the way to Watford Junction. This would simplify operation at Queens Park, Stonebridge Park and Harrow & Waldstone. Suppose too, that the Watford DC Line service were to be run by New Tube for London trains. Digital signalling could easily handle 33 tph along the route. This last section has very much been speculation on my part, but it shows how it may be possible to create a service on the Bakerloo Line with the following characteristics. All trains would be identical New Tube for London trains. In my view, that extension does what it says on the tin and creates a new twenty-seven tph service between Elephant & Castle and Lewisham, which brings new services to an area of South-East London, where they are much needed. Effectively, the Bakerloo Line could become two twenty-seven tph lines, that happen to connect back-to-back at Elephant & Castle station to enable cross-London journeys. Taking the figures in the current table, Crossrail will add 36,000 pph in both directions across London, to a current capacity of 254,876. This is a increase of fourteen percent on the current total capacity. Increasing the frequency from twenty-four to thirty tph, adds another 9,000 pph in each direction, which is an increase of seventeen percent on the current total capacity. It is very likely, that Crossrail has been designed, so that the train length can be changed as required. The initial trains have been supplied as seven-car trains and when the line opens nine-car trains will be used. I have read somewhere that the trains could be extended to ten cars, but eleven might be a bit difficult. So what would be the effect on capacity of ten-car trains. I will assume each ten-car train has a capacity of 1500 *10 / 9 = 1667. This means that Crossrail capacity is increased as follows with ten-car trains. 24 tph gives a capacity of 40,000 pph in each direction. Or sixteen percent on the total current capacity! 30 tph gives a capacity of 50,000 pph in each direction. Or twenty percent on the total current capacity! It looks like Crossrail might have been built to be expanded. It is my view that the East London Line will eventually be digitally signalled and there could be an increase in frequency from the proposed twenty tph. It has been stated in the past, that the East London Line will eventually have a service based on six-car trains, running at a frequency of twenty-four tph. Six-car trains could be a problem, as some of the stations like Canada Water, Shadwell, Wapping and Rotherhithe are a bit short for five-car trains and use selective door opening. The hopefully high-capacity connection to Crossrail at Whitechapel station will surely drive more passengers to use the East London Line. So increasing the frequency to twenty-four tph using digital signalling would be an option to increase the capacity. There are four separate services on the East London Line. Each currently has a srvice of four tph, but it is planned that six tph will run to Crystal Palace and Clapham Junction before 2020. Note that all services terminate in a dedicated platform, that is not shared with other services. With modern signalling and good driving, these platforms should be able to handle six tph. If all services went to six tph, that would mean twenty-four tph, through the core of the East London Line. This would mean that the capacity of the line would be 20,160 pph in each direction, which would be a fifty percent increase on current capacity. There may even be space for more trains through the core, as thirty tph is certainly possible with digital signalling. But where would the trains terminate? Extra tunnel-capable Class 378 trains to run the extra services shouldn’t be a problem, as new Class 710 trains, will displace the older units from the Watford DC and the North London Lines. It is my view that the North London Line will eventually be digitally signalled to allow a more intensive passenger service than eight tph, amongst all the freight trains. I have said that twelve tph between Willesden Junction and Stratford will be possible, within a few years. But this could be the limit for the following reasons. Terminating twelve tph in the two platforms at Stratford is probably possible but difficult. Clapham Junction with one platform can probably handle six tph but no more. Only Richmond has enough capacity for extra trains. It looks to me that digital signalling and well-designed new trains can improve the capacity across London. Or Liverpool, Newcastle or Berlin to name just three major cities. What Is The Operating Speed Of Class 710 Trains? So far, five classes of Aventra trains have been allocated TOPS numbers and their own Wikipedia pages. The other orders for West Midlands Trains are given as 145 kph for the Cross-City Line and 180 kph for longer distance trains, in Wikipedia. Looking at these speeds, I think that the operating speed of the Class 710 trains, must either be the 145 kph of the Crossrail trains or the 160 kph of the suburban trains. Or they could be the 121 kph of London Overground’s Class 378 trains. But it has not been disclosed. As probably most Aventras use similar running gear and electrical and control systems, I wouldn’t be surprised that maximum operating speed, is just a setting in the train’s control computer. Timings on London Overground’s routes, that will be run by Class 710 trains are as follows. Comparing the new Class 710 trains to the current Class 315 and Class 317 and Class 378 trains, there are or may be performance differences. Class 315 and Class 378 are slower trains with a 121 kph operating speed. Class 317 trains have an operating speed of 161 kph. Dwell times mat be less on the new trains compared to some or all of the existing types. So how will these differences effect the various routes? There seems to be long turnrounds on this service and I’m fairly certain faster trains could run this service more efficiently, which may mean that the same number of trains could run at a frequency of four trains per hour (tph). This service is based on a six minute turnround and I suspect could be run more efficiently, if a faster train could get each way in under thirty minutes. It looks like this four tph service is run pretty efficiently, but there is a ten minute turnround at Chingford. The Liverpool Street to Enfield Town service waits nineteen minutes before returning, so small savings in dwell times and a faster train, might allow a two tph service to be setup, where trains depart on the half-hour, using just two trains. Four tph, which is planned to start on this route in 2019, would need just four trains. Faster trains with shorter dwell times will certainly improve the timings and frequency of London Overground’s services, that they intend to run with Class 710 trains. I’m pretty certain, that they will enable the following. They will also improve timings on Liverpool Street to Cheshunt. But what will be the operating speed of the Class 710 trains? Or it could be the 12kph of the current Class 378 trains. I think that 145 kph, will be able to handle the two planned increased frequencies of four tph. 145 kph is identical to the Crossrail trains. 160 kph is identical to the Greater Anglia trains. 121 kph is identical to the London Overground Class 378 trains. 160 kph seems to be the speed of suburban Aventras. It’s a difficult one to call! It is being proposed that the Bakerloo Line be extended to South East London. 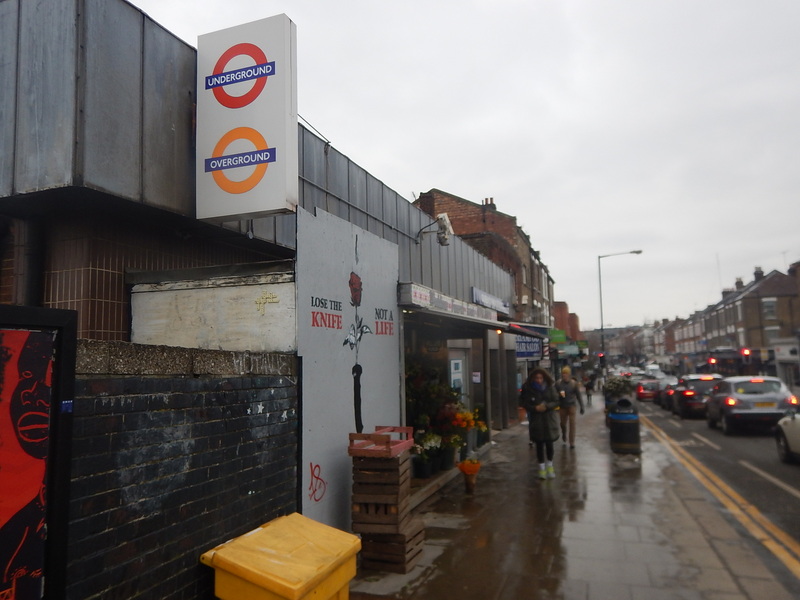 There will be two new stations on the Old Kent Road. There will be a connection to the existing New Cross Gate station. The extension will terminate at Lewisham station. The extension will be totally underground. Provision will be made to extend the line further. Almost nothing has been said about the frequency of trains on the line, stabling arrangements for the trains or what happens in the North. Wikipedia gives the current off-peak services on Bakerloo line as. This forms a 20 tph service (or a train every 3 minutes) between Queen’s Park and Elephant & Castle. As there will be new modern signalling and new trains on the Bakerloo Line in the future, are Transport for London relying on these to increase the frequency of trains. Currently, there are thirty-three trains in service and according to the November 2017 Edition of Modern Railways, these will be replaced with forty new trains, which will give a twenty-five percent capacity increase. As the Northern and Jubilee Lines run at 27 tph, with modern signalling and newer rolling stock, I suspect that at least this train frequency could be achievable. The Bakerloo Line has three depots. London Road depot is located between Lambeth North and Elephant and Castle stations. This Google Map shows the location of the depot. It is the V-shaped site, just below the roundabout, at the top of the map, where London Road, Westminster Bridge Road and Borough Road meet. However good this depot is for servicing trains, it strikes me that it is in a location, where land is very expensive. I think one of two things will happen. The depot will be closed and the land given over to development. The depot will be rebuilt and there will be housing or commercial development on top. If the latter happens, it is probably an affordable way to get a modern depot. White City depot on the Central Line is already under property development. Stonebridge Park Depot is relatively modern and is located to the North of Stonebridge Park station. Because of its young age and size, the only thing likely to happen at Stonebridge Park would be some modernisation for the new trains and a possible appropriate increase in capacity. Queens Park Depot is not large and is effectively two sheds either side of Queens Park station. The North and South Sheds. The cross-platform interchange between the Watford DC Line and the Bakerloo Line. The platforms on the main lines are not operational at present, but may be so in the future. Compared to the other two depots, Queens Park would appear to be less important. I suspect though, that Transport for London have plans to improve operations at Queens Park. The following should be noted. The new trains will probably, be the same length as current trains. But as there are going to be 40 instead of 33, more space will be needed. A rebuilt London Road depot with housing and/or commercial development on top, could raise a substantial sum. There is space for extra sidings at Stonebridge Park depot. There will be turnround sidings on the extension to Lewisham in the overrun tunnels, which is standard London Underground practice. The new trains should need less maintenance than the current nearly fifty-year-old 1972 Stock trains. I think by some clever design, that the extra seven extra new trains will be incorporated in the two major depots of Stonebridge Park and London Road, with some help from Lewisham and Queens Park. These are various points and issues. Queens Park station is a six platform station. Two unused platforms for the slow lines into Euston station. There is an excellent cross-platform interchange between the Wstford DC and Bakerloo Lines, which is level between train and platform. Wikipedia also says this about the station. Queen’s Park is planned to become a step-free station and the project will be completed in 2019. I visited the station this morning and saw no work in progress. This picture shows the station’s rudimentary nature. Opposite the station is a typical new block of housing, with a Marks and Spencer Simply Food store underneath. So perhaps a developer will build some much needed housing. Underneath would be a much-improved station, with full step-free access. There could be some retail units. They might even rebuild the sheds of the depot, that I mentioned earlier to improve the operation of the trains. The two disused platforms could be refurbished. These pictures show the platforms. This project could be carried out independently of the Bakerloo Line Extension. Between Queens Park and Harrow and Wealdstone stations, the two lines share tracks, with trains calling at eight intermediate stations. Current Bakerloo Line frequencies are. 12 tph between Queens Park and Stonebridge Park. In addition, there are three tph on the London Overground between Queens Park and Watford Junction. This arrangement means that passengers between Queens Park and Watford Junction stations have a flexible route to and from London, with a choice of Euston or Central London termini. London Overground are replacing the current five-car Class 378 trains on the Watford DC Line with four-car Class 710 trains. This might seem to be a reduction in capacity, but it is part of a cunning plan. The Class 378 trains will go to the East London Line, to enhance services. It means that London Overground can maintain all the dual-voltage Class 710 trains at Willesden TMD. Class 710 trains can’t work the East London Line, as they have no end doors for tunnels. To compensate for the shorter trains, the frequency on the Watford DC Line will be raised from three to four tph. The Watford DC Line will actually get a small capacity increase from fifteen carriages per hour to sixteen, with a much more passenger-friendly frequency of a new train, which may be slightly faster, every fifteen minutes. But there is also a nugget in the tail. The Watford DC Line currently handles five-car Class 387 trains. So if in a few years there is a need for more capacity, the Class 710 trains could be lengthened by adding a fifth carriage. Given too, that there could be a lot of resignalling on this line, in conjunction with the Bakerloo Line extension and the new Bakerloo Line trains, I would not be surprised if train frequency and/or length on the Watford DC Line were to be increased again. These pictures show some of the platform height problems on the platforms shared by Bakerloo and Watford DC Line trains. The interchange at Queens Park station is level between both trains and the platform. Both the Class 710 trains and the new Bakerloo Line trains will be walk-through, which will ease the design of an acceptable dual-height platform, when both new trains are in service. Passengers will be able to walk up and down to find a seat or a convenient place to exit. One solution to the height proble, would be to lower the platform, so that it is level with the height of the new Bakerloo Line trains. A hump similar to a Harrington Hump could be added at a convenient point. This picture shows two well-designed humps at Canonbury station. The humps on the Watford DC Line, would be sized as follows. Height would allow level access to a Class 710 train. Width would be determined by safety. Length would probably be sized to fit two cars, which would be 40 metres. The humps would be placed at an appropriate point on the platforms, which are long enough to take the current 113 metre long 72 Stock trains. Drivers of Class 710 trains, would stop, so that, cars 2 and 3 were aligned with the hump. Drivers of Bakerloo Line trains would stop, so they had the hump in the middle of the train. Doors would then only open, where the access from train to platform was level. All this would probably be handled automatically, with the driver monitoring everything. It’s almost as if the trains had their own built-in platform-edge doors, which would ensure that safety was at least as good as it is now. Will The New Class 710 Trains Reduce Timings On The Watford DC Line? Everything published about the proposed Bakerloo Line Extension, does not mention the following. What happens North of Queens Park station. Until proven otherwise, there seems to be few difficult problems, that effect the building of the Bakerloo Line Extension. Modernising the line and building the extension would appear to be a series of separate projects. The November 2017 Edition of Modern Railways (MR) has a news item entitled Nine More Class 710s Planned. Transport for London is proposing the acquisition of nine additional Class 710 EMUs from Bombardier to support the London Overground rxtension to Barking Riverside and an enhanced service on the East London Line. Transport for London (TfL) are ordering six five-car and three four-car Class 710 trains. This article on London Reconnections (LR) is entitled More Trains for London Overground: A Bargain Never to be Repeated. The title gives a clue as to the first part of the article and it talks about how it may be necessary for TfL to get their order in now to get the best terms and price for the trains. Putting the two articles together, some interesting train use could be happening on the various lines of the Overground. Certain improvements have been planned for the East London Line. The current fleet of 57 Class 378 trains are now five cars in length, after starting at just three cars. Many of the stations on the East London Line could accept six-car trains and the other could be worked using selective door opening. So TfL probably have an option to increase capacity on the East London Line by twenty percent, by adding an extra car to the Class 378 trains on the line. The Class 378 trains are also certified for working the Thames Tunnel, whereas the Class 710 trains don’t appear they will be. A 24-hour service on Friday and Saturday nights, between New Cross and Dalston Junction/Highbury and Islington stations. This will happen in December 2018, when Stage 3 of Crossrail opens between Abbey Wood and Paddington stations, with a connection to the East London Line at Whitechapel station. When you consider that Whitechapel will be served by 12 x nine-car Crossrail trains per hour (tph) from December 2018 and 24 x nine-car tph from May 2019, you do wonder if the East London Line’s sixteen x five-car tph will cope with the extra passengwe. TfL have said they will increase the core frequency of the East London Line from sixteen tph to twenty in 2021. I wrote about this two years ago in Increased Frequencies On The East London Line, so the plan is an old one, even if it has slipped a bit. The original plan envisaged the following extra trains on the East London Line. It would need the following. More Class 378 trains, as the Class 710 trains are not certified for the Thames Tunnel. Improved digital signalling in the core, which would eventually enable twenty-four tph. The LR article suggests that there may be capacity problems at Clapham Junction station and two tph to Battersea Park station is suggested as an alternative. Battersea Park station is already served by the Overground, with this service, which is detailed in Wikipedia. 1 train per day to Highbury & Islington / 1 train per day from Dalston Junction. Until December 2012, Southern operated a twice-hourly service from London Victoria to London Bridge via Denmark Hill. This ceased when London Overground’s Clapham Junction to Dalston Junction service commenced at that time. 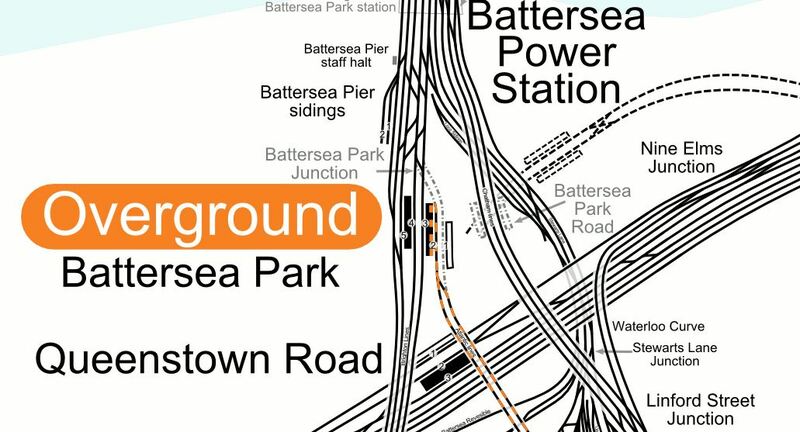 However, since December 2012, a skeleton London Overground service has run to/from Battersea Park (instead of Clapham Junction) at the extreme ends of the day to retain a “parliamentary service” between Battersea Park and Clapham High Street. This map from carto.metro.free.fr shows the track layout at Battersea Park station. The single track going in to Platform 2. Platform 1 at Battersea Park station is disused. The close proximity of the station to the new Battersea Power Station station, that opens in a few years. These are some selected pictures of Battersea Park station. I think it is true to say, that it is a Victorian station, that wasn’t designed for the modern age. The booking hall is a tidy Victorian example. There is a lot of excellent Victorian detailing. Platform 2 and 3 is wide with sensible stairs. Platform 2 is a well laid out terminal platform. Platform 4 and 5 is narrow with terrible stairs. Plstforms 3 and 4 seem to be long enough for ten-car trains. It could be turned into what Roy Brooks would have called something better than a ruin. For those of you born since 1960, check the link to a memory of one of the world’s late great honest estate agents. I’m sure Londoners used to buy the Sunday Times, just to read his adverts. I can remember my late wife sitting on the sofa, laughing loudly, as she read aloud an advert about a flat, that wouldn’t suit an owner with a cat,. Battersea Park station and a two tph service from Dalston Junction across South London have a lot going for them. I’m sure a budding Lord Foster or Zaha Hadid could come up with a scheme to fix the platform access and make the station passenger friendly and their name. The station is a short walk from Battersea Power Station station and must open up routes across London. Battersea Park station could easily handle two tph on a single platform. In A New Station For Battersea, I talked about a proposal to create a station at Battersea that linked the new tube station to the Southeastern lines into Victoria. In Four Trains Per Hour Between Dalston Junction And Battersea Park Stations, I write about how on the 6th November 2017, because of a track fault, London Overground ran a four tph shuttle between the two terminals. Will all of this be tied together? Doing a quick calculation, I think that each of the four branches need the following number of trains for four tph. Which gives a total requirement of 26 trains. Up the frequency to six tph on each branch or one train every 2½ minutes, which would be 24 tph through the Thames Tunnel and you get the following. Which gives a total requirement of 39 trains. If you just have an increase to six tph on just the Clapham Junction and Crystal Palace routes as London Overground are proposing for 2020, you get the following. Which gives a total requirement of 34 trains, providing a service of one train every 3 minutes, which would be 20 tph through the Thames Tunnel. This is eight more trains than at the present time. It’s all rather impressive for the Thames Tunnel, which was built between 1825 and 1843, by the Brunels. If we look perhaps ten years into the future, the following will have happened. Crossrail will be running more than 24 tph through Whitechapel. Automatic Train Operation (ATO) will be driving the trains, with the driver keeping a vigilant watch, just as happens on the Victoria Line now! Passenger information and management will have improved and passengers will be able to handle the increased frequency of trains easily. So if Dear Old Vicky can manage thirty-six tph in a 1960’s tunnel, will the East London Line be able to manage the same frequency in an 1840’s tunnel? The Brunels would have made sure it happened and if it is needed, so will their engineering successors! Let’s cut it back a bit and aim for 32 tph through the Thames Tunnel, as that was the sort of target engineers were looking at, for the Victoria Line in the 2000s, when the East London Line was being proposed. How many trains will be needed to run the eight tph on the four routes, that would comprise thirty-two tph through the Thames Tunnel? Which gives a total requirement of 52 trains. The London Overground has fifty-seven Class 378 trains. I can’t believe that the original fleet was sized on eight tph in operation through the tunnel and a few as hot spares and in maintenance! But surely eight tph is impossible, as turning the trains at the terminal platforms would be too much! The Victoria Line at Brixton and Walthamstow Central stations handles 36 tph using two platforms or 18 tph per platform. The Northern Line is targeting 36 tph on both lines, when it has been split into two. With ATO, I’m sure each terminal platform can handle more than eight tph. According to the LR article, the planned new services on the East London Line will require another eight trains. This fits with my calculation. These trains have to be Class 378 trains, due to evacuation issues in the Thames Tunnel. These trains have to be able to work on lines with third-rail electrification. London Overground has ordered six five-car Class 710 trains and they will be run on the North London Line and West London Line, where they will displace some five-car Class 378 trains for running on the East London Line. Some five-car Class 378 trains on the Watford DC Line will also be replaced by four-car Class 710 trains. So it would look like the East London Line will get some of the eight Class 378 trains that it needs. The LR article says this. London Overground have a long-held desire to increase the frequency on the WLL from 4tph to 6tph. They also aspire to another 2tph (at least) from Clapham Junction continuing to Stratford, to further increase the frequency on the North London Line (NLL). This would enable 10tph on eastern end of the North London line. This is due to be implemented with with main order of the new Class 710 stock. The article also suspects that London Overground want to run the following services. This would deliver a twelve tph service between Stratford and Willesden Junction. Living about halfway between those two stations, I’m not complaining. But the article concludes, that London Overground’s objective can’t be achieved until some freight is moved to the Gospel Oak to Barking Line after the electrification of that line is completed. As I said earlier, the pair of lines will get six extra five-car Class 710 trains and displace some Class 378 trains to the East London Line. So will London Overground stick with a mixed fleet on these lines? Or will they perhaps run one class on each route? I have no idea, but there are quite a few Class 378 trains, that could be displaced by new Class 710 trains to allow the East London Line frequency to be increased. Currently the Watford DC Line has a three tph service and I suspect that this needs six five-car Class 378 trains to run it. The LR article says that London Overground want to run four tph on this line and I calculate this will need eight four-car Class 710 trains. The new trains will probably be a few minutes faster and they will offer an hourly capacity increase of six percent. But they will release six five-car Class 378 trains to strengthen services on the North, East and West London Lines. Step-free access from platform to train is not good on the Watford DC Line. You step up into a Class 378 train and step down into a Bakerloo Line 1972 Stock train. These pictures show the problem with the Class 1972 trains. When I got off one of these trains at Willesden today it was a jump. It is some of the worst step-free access on the Underground. On my short trip on the Bakerloo Line today, I deliberately sat in the last carriage. On most stations the the last carriage was aligned with the end of the platform, which leads me to the conclusion, that most stations are about as long as the trains, which are over 110 metres long. Can a step-free platform be designed, that will work with the following trains? The current Underground 1972 Stock. The latter could make design more difficult, if the train is built for Unattended Train Operation (UTO) and if platform edge doors are needed at all stations with UTO. The only solution I can think of, is one that is used in Karlsruhe in Germany and is now being used at Rotherham Central station to accommodate main line trains and Class 399 tram-trains. The platform is long enough to have two sections, with different platform heights. A high section is used with the main line trains. A low section is used with the Underground trains. Platform edge doors could be fitted to the low section. A gentle slope would connect the two sections. Entry to the combined platform could be near where the two sections join. Given that the length of a Class 710 train is around 80 metres and that of a 1972 stock is in excess of 110 metres, it will be a long platform. Selective door opening will be installed on all trains. I do wonder, if the new trains for the Watford DC Line are only four cars to ease the problem of step-free access. The reduced length could knock twenty metres off every platform. Could we even see the new Underground trains built to a shorter length? I’m sure that a workable platform design is possible. The Bakerloo Line is being extended to the South, but nothing has been said about how it will be changed in the North. Possibilities for Northern terminals for the line could include. It’s also complicated because the depot is at Stonebridge Patk. I wouldn’t rule out extending the of the Bakerloo Line to Watford Junction, as is talked about in Wikipedia under Re-extension to Watford Junction. What would be the consequences, if the following were to be done? An extended Bakerloo Line has an increased frequency of at least twenty tph between Watford Junction and Lewisham. The new trains for the Bakerloo Line are faster. The new Bakerloo Line trains had a capacity increase from the current 700, so they carried about the same as the five-car Class 378 trains. The increased frequency of Bakerloo Line service, would probably result in London Overground’s Euston to Watford service to be discontinued. The benefits would be as follows. Stations from Queen’s Park to Watford Junction would get a more frequent service, of possibly a train every three minutes. The problems of step-free access and platform-edge doors would be solved, as all trains would be on the Bakerloo Line. London Overground would not need any platforms at Euston, which could help in the rebuilding of Euston for HS2. It would also mean that London Underground got another high-frequency Underground Line without any junctions, that could be run very efficiently. But it would mean Kilburn High Road and South Hampstead stations would lose their connection to Euston. Reopening Primrose Hill station has been mooted in the past. This is said in the Wikipedia entry for the station. It has been proposed to re-open Primrose Hill station by bringing the short stretch of line between South Hampstead and Camden Road stations back into the regular passenger service by incorporating it into the London Overground network. A reopened Primrose Hill station, would only be a short walk to Chalk Farm station. At Willesden junction station, there is even a convenient South-facing bay platform, that is numbered 2 and could handle four tph. The picture shows a Class 378 train in Platform 2 at Willesden Junction station, was taken on Sunday, the 2nd of October 2016, during engineering works, when a Rail Replacement Train was run between Willesden Junction and Stratford stations. Where would you terminate the service at its Eastern end? Highbury and Islington, Stratford or somewhere else, like perhaps a reopened Maiden Lane station? Kilburn High Road and South Hampstead stations sill lose their srtvoce to Euston and they would have to change at Highbury and Islington. Organising the time-table might be difficult. I also think, it would mean that Kensal Green station would be very difficult to make step-free, if it had to be served by both Overground and Bakerloo Line trains. On the other hand, Queen’s Park station is an excellent example of a step-free cross-platform interchange between the two types of trains and Willesden Junction station could be equally good. All these three lines either serve Watford Junction or it has been suggested that they do. Plans to extend Crossrail up the West Coast Main Line would probably include a stop at Watford Junction, if they materialise. Extending the Bakerloo to Watford Junction is suggested from time-to-time. The Watford DC Line already serves Watford Junction station. Given that a high-frequency efficient extended Bakerloo Line running between Watford Junction and Lewisham would serve the smaller stations on the way to Watford very capably, I suspect that whatever happens to Crossrail and the Watford DC services, the Bakerloo Line will be extended to Watford Junction. The extended Bakerloo Line would have the following characteristics. Probably all trains running between Watford Junction and Lewisham. No junctions and end-to-end running like the Victoria and Jubilee Lines. Full step-free access at all stations. New faster, walk-through trains with wi-fi and 4G. An efficient connection to Crossrail at Paddington will be opened in December 2018. It may be London’s forgotten line, but once extended, it could be a new star. Especially, if it gets to be linked directly into Old Oak Common station for all the services including HS2, that will be available there. The Watford DC Line doesn’t connect to Crossrail, which makes me feel, that when everything gets decided about the extended Bakerloo Line and the new station at Old Oak Common, then the Watford DC Line could miss out. I seem to remember reading in Modern Railways about ten years ago, that there was an ambition in TfL to extend some East London Line trains to Willesden Junction. 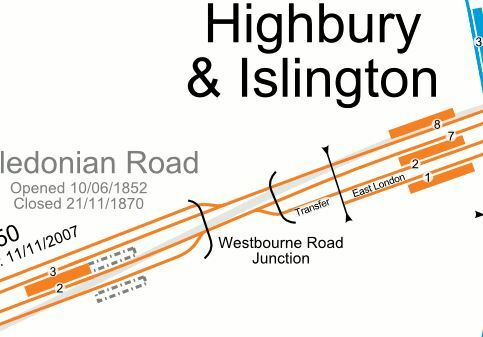 Look at this map from carto.metro.free.fr, which shows the lines at Highbury and Islington station. Note the single line labelled Transfer, that connects Platform 2 at Highbury and Islington station to the Westbound North London Line, that runs through Platform 7. I think it would be possible to make Platform 2 into a bi-directional through platform. All Westbound trains on the Westbound North London Line would leave from the island platform between platforms 2 and 7. Voltage changeover between 750 VDC and 25 KVAC would take place in Platform 2. A four tph service in both directions would mean a train every 7-8 minutes. The four-track section of the North London Line between Highbury and Islington and Camden Road stations, includes two reversible lines. Was this all future-proofing to allow services to run between the North London and East London Lines? 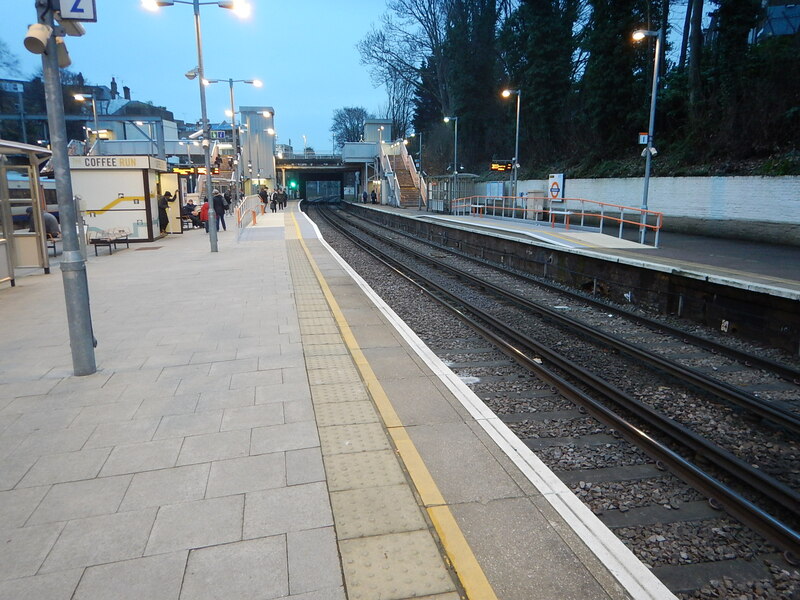 It is interesting to note, that Platform 2 is used for services to and from West Croydon station. These services take around 51-55 minutes and currently need eight trains for a four tph service. This screen capture shows the train timetable, when I rode between Highbury and Islington and Willesden Junction stations. Note that the journey takes 22 minutes. I am led to the conclusion, that it would be possible to run a service between West Croydon and Willesden Junction stations. The service would run via Kilburn High Road, South Hampstead and and a reopened Primrose Hill stations. It would have a frequency of four tph. Trains would change voltage at Highbury and Islington station. I would certainly like the service for these reasons. I regularly travel along the North London Line from the West to Dalston Junction station. The change between the North and East London Lines at Highbury and Islington can be very busy. Going West along the North London Line from Dalston Junction can involve a lot of walking up and down at Highbury and Islington station. Using Dalston Kingsland station to go East can be difficult, as there are masses of passengers changing between rge two Dalston stations. I like to go to Primrose Hill and London Zoo. Could the service also ease the pressure on Camden Town station, until the upgrade is complete? I have no idea if London Overground would do this, but if there was a vote, I’d say yes! I have never seen a detailed analysis of running trains on the Gospel Oak to Barking Line (GOBLin). Currently, eight Class 172 trains provide the four tph service. Consider this round trip. It is a very generous timetable. There is a twenty minute turn-round time at both ends of the route, which is good for recovering the timetable after a delay. The Class 710 trains could save time at every one of the ten stops, as they accelerate faster, have smooth regenerative braking and should have a better platform-train interface. This leads me to the conclusion, that the Class 710 trains could run a faster service on the line. Barking Riverside station will only be a short distance from Barking station and I suspect, it would only add ten minutes at most to the end-to-end journey time. As there is a twenty minute turn-round time, I suspect that a train will be able to go from Gospel Oak to Barking Riverside and back again in under two hours. This would mean that the current service of four tph could be possible on the extended route, with the same fleet of eight trains. This is said in the MR article about the Class 710 trains. The remaining two additional four-car units would support the extension of Gospel Oak to Barking services to Barking Riverside. This leads me to one of these conclusions. The service is going to be extended somewhere else. The frequency on the route is going to be increased to five tph. The next few sections deal with the various options. I sometimes change between the GOBLin and the North London Line, as I can get a convenient bus from my house to Harringay Green Lanes station. Allowing GOBLin services to continue along the North London Line would need extensive and expensive remodelling of Gospel Oak station to create an Eastbound plstform for the GOBLin. The tracks to the West of the station, would probably need to remodelled to allow efficient operation. The GOBLin trains would also be four-car trains, as opposed to the five-car trains on the North London Line. By using the Carlton Road Junction after Upper Holloway station, GOBLin trains could access the Thameslink tracks and go North to a convenient station. Unfortunately, the track layout is such, that crossing to the Dudding Hill Line is difficult. But continuing to the proposed Brent Cross Thameslink station is surely a possibility. Although, I can’t see anything happening until plans for the West London Orbital Railway are agreed and Brent Cross Thameslink station is opened. So it can probably be discounted for a few years yet! Barking Riverside station is being built so that an extension under the Thames is possible. But as a tunnel would be involved, I can’t see this extension being started or even planned fully for several years. If two extra trains are added to the GOBLin fleet, this would mean that there are ten trains, which would be enough to run a five tph service between Gospel Oak and Barking Riverside stations. I think this will be the most likely use of the two extra trains on the GOBlin. The Romford To Upminster Line is slated to get a brand-new Class 710 train to work the two tph shuttle. The DR article says that it is possible that this line could be served by a Class 315 train, held back from the scrapyard. This would mean a new Class 710 train could be deployed elsewhere, where its performance and comfort levels would be more needed. Surely, this would be enough capacity for the line and a lot cheaper than a new Class 710 train! Provided of course, that it was reliable, comfortable and could maintain the current two tph service. I discuss this in detail in A Heritage Class 315 Train For The Romford-Upminster Line. It looks like Transport for London are planning for a large increase in services on the East London Line. At Queen’s Park station, the Bakerloo and Watford DC Lines join as they go towards Watford Junction station. This map from carto.metro.free.fr shows the lines at Queen’s Park station. Note how there is a cross-platform interchange between the two pairs of lines. Northwards from Queen’s Park station, the platform height is a compromise, with a step down into an Underground 1972 Stock train and a step up into Class 378 train. It is not level access by any means and very difficult for wheel-chair users or those pushing buggies or heavy wheeled cases. I suspect that at some point it could even be illegal under disability regulations. With a more intense service, loading and unloading trains may become a seriouscause of delay. It is not just a would-like, but a must-have. Queens Park station though, is totally level. The current five-car Class 378 trains are 100 metres long, which compares with the 113 metre length of the 1972 Stock train. One way to solve the platform height issue, would be to have a dual height platform with one end of the platform level access for the 1972 Stock and the other for the Class 378 train. This would probably need a platform of the order of 215 metres. But London Overground have ordered a set of four-car Class 710 trains for the Watford DC Line. These trains will be perhaps 80 metres long, as the type will be shared with the shorter platforms of the Gospel Oak to Barking Line. This shorter length train should make the design of a dual-height platform acceptable to all users a lot easier. Currently Off Peak services through Willesden Junction are as follows. 9 tph on the Bakerloo Line. Some sources mention that there are ambitions to run 27 tph on the Bakerloo Line. So even if all the trains went through to Watford Junction, that would only mean 30 tph stopping at stations on the line. Currently, 2 tph on the Bakerloo Line turnback at Queen’s Park station, so it looks like with good deual-height platform design, the current schedule of three tph on the Overground, stopping at South Hampstead and Kilburn High Road can be continued and supplemented with perhaps 18-20 tph on the Bakerloo Line North of Queen’s Park station. Platforms could be about 180-200 metres long, with a height to fit the Bakerloo Line trains. At one end they would have an 80 metre section of platform to suit the Class 710 trains. The Class 710 trains would obviously be wheelchair friendly, like the current Class 378 trains, but they would be designed to fit a typical station on the Watford DC and Gospel Oak to Barking Lines. If Class 378 trains were also providing services on the line, they would use their selective door opening to use the four-car raised section of the platform. So, if the stations were to be given lifts to fit the new dual-height platforms, the service would have the following characteristics. Totally step-free and level access at all stations for all trains. South Hampstead and Kilburn High Road stations would keep their current service. Most stations would have an increased service. 27 tph through the central section of the Bakerloo Line would be enabled. The biggest problem would be walking or pushing to the right end of the platform for your train, at stations served by both size of train. 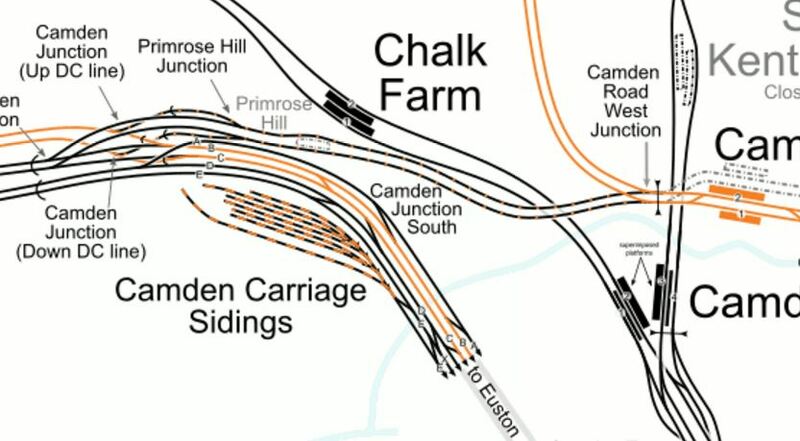 I was looking at the tracks through Camden on carto.metro.free.fr, as I wanted to see how the former Primrose Hill station fitted into the knitting. Note the two orange tracks of the Watford DC Line from Euston curving to the West around the carriage sidings. The line through Primrose Hill station from Camden Road is a connection that allows freight trains to go between the North London Line and the West Coast Main Line. One of the plans for the area, is to reopen the station. This is said in the station’s Wikipedia entry under Plans. South Hampstead station is just off the map to the West on the Watford DC Line. 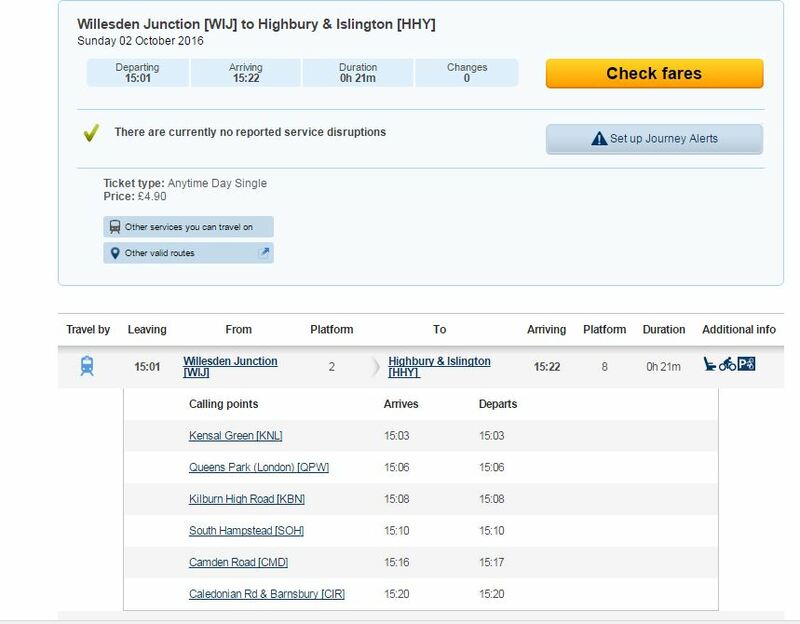 Obviously, the station will have to be rebuilt, but look at this page from the Journey Planner for Sunday, the 2nd of October, when I enquired how you would get between Willesden Junction and Highbury and Islington stations. As the Class 378 trains can’t fly, the route via South Hampstead station must be open and available to the trains. This sequence of pictures shows a train entering Camden Road station after coming through the site of the former Primrose Hill station. The current setup seems to be rather a waste of resources, with two tracks into Euston for the Watford DC Line and the need for platforms with third-rail electrification to handle the short four- and five-car trains. Euston station is a very busy station and it would probably be glad to lose the Overground services. So it might be a good idea to divert the three trains per hour (tph) between Watford Junction and Euston, through Primrose Hill and onto perhaps Highbury and Islington or even Stratford stations. Others might not think so, as all those passengers along the Watford DC Line, would lose their direct connection to Euston. But in a few years time, the following projects should have been completed or will be in progress. Plans for Old Oak Common station will be well advanced. El;ectrification of the Gospel Oak to Barking Line (GOBlin) will be complete. Rebuilding of Euston station for HS2 will have started. Capacity and station improvements at Highbury and Islington station will be known, which should give better access to the Victoria Line and the Great Northern Metro. The Metropolitan Line will have reached Watford Junction, by way of the Croxley Rail Link. The future of the Bakerloo Line will have been decided. West Hampstead Interchange might have been progressed. These projects will mean that the Watford DC Line could and will have to be reorganised. If only to make sure there was enough capacity for commuters in the Peak and electric freight trains. In my view the service on the Watford DC Line to London, should be as close to a high-capacity link running perhaps six to eight tph as is possible. It is not as easy to achieve as many might think. London Midland services stop at stations on the Watford DC Line. The Bakerloo Line runs 6 tph on the line. The train size limit on the Watford DC Line is probably about six cars and might be possible to raise to say eight or ten. The train size limit along the North London Line is currently five-cars and all the Class 378 trains are this length. Six-car trains on the North London Line is probably an upper limit, although I wouldn’t be surprised to see longer platforms in my lifetime. There will be pressure to increase the number of freight trains on the North London Line. A Northern terminal for the Bakerloo Line must be provided. Third-rail electrification must be provided on all track shared with the Bakerloo Line. If possible, the route should avoid Euston, so that the HS2 rebuilding can proceed at a faster pace. But I suspect an innovative solution will be found to provide a high capacity link between the stations on the Watford DC Line and Central London. Crossrail will have a massive influence on how passengers use London’s rail network. Plans have been talked about for extending Crossrail to the West Coast Main Line. Wikipedia says this. Network Rail’s July 2011 London & South East Route Utilisation Strategy (RUS) recommended diverting West Coast Main Line (WCML) services from stations between London and Milton Keynes Central away from Euston, to Crossrail via Old Oak Common, to free up capacity at Euston for High Speed 2. But Crossrail with its massive trains carrying fifteen hundred people a time, will strongly influence stations and routes it connects to Central London. At Abbey Wood, it is forcing an update to services on the Noirth Kent Line, which could bring 6-10 tph through the Medway Towns. At Moorgate, it will bring passengers to an updated Great Northern Metro sending 8-10 tph to North London and South Herfordshire. At Reading, it will bring passengers to updated Thames Valley and West Country services. At Shenfield, improvements are in progress to link Crossrail to Essex and East Anglia. Where Crossrail will lead is an unanswerable question. North-West from Old Oak Common, there are several stations that could be possible Crossrail termini. Watford Junction has been suggested before. In the end, passenger numbers will decide where the trains go. This map from carto.metro.free.fr shows the lines at Watford Junction station. The North-South orange line is the Watford DC Line, which goes starts from Watford Junction station and goes through Watford High Street, Bushey and Carpenters Park stations. 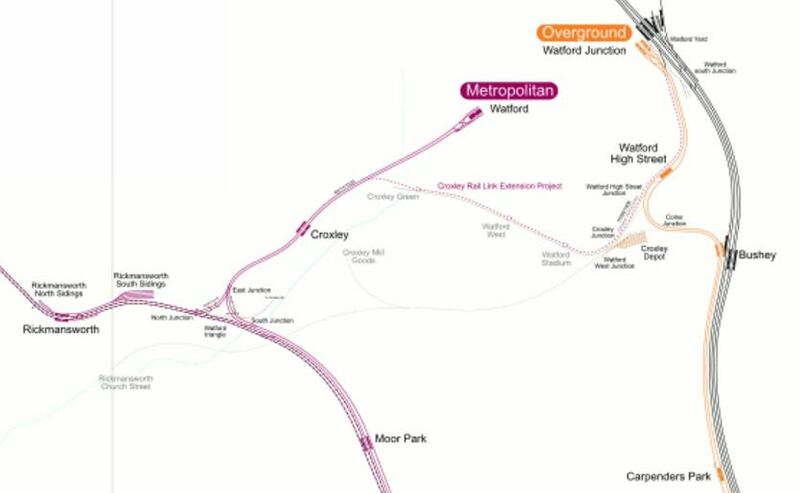 Note the Croxley Rail Link going between Croxley and Watford Junction stations. This short length of new line would also make possible direct services between Amersham and Watford Junction stations. I’m not going to speculate on where trains on Crossrail and the Watford DC Line will go, but there are lots of possibilities. I suspect that new housing developments will also be a driver of the routes of services. The Watford DC Line is going to see some some extra trains from the new fleet of Class 710 trains. If we see eight trains of the new dual-voltage fleet going to the GOBlin on a one-for-one replacement basis, that would mean a doubling of capacity on the line, that means that only six trains are left for the Watford DC Line. But as the Watford DC line runs three tph currently in the Off Peak and the trip takes about fifty-five minutes, then perhaps those six four-car trains might be enough. When I first read the specification for the Class 710 trains for the GOBlin, I was surprised to see that they were dual voltage. After all between Gospel Oak and Barking stations, there is precisely no third-rail lines. But if you think about extending GOBlin services, the ability to run on third-rail lines would be needed on the following routes. The Barking Riverside Extension to Abbey Wood. Abbey Wood, Clapham Junction, Richmond and Watford Junction stations all have third-rail platforms. I doubt all of these routes will be delivered, but at least by making the GOBlin trains with a dual-voltage capability, they are future-proofed for any possible services. The Bakerloo Line is a line, with spare capacity across Central London, according to many reports I’ve read. Wikipedia has a section on the Future of the Bakerloo Line in its entry for the Watford DC Line. Various proposals have been made to alter services involving both extending or truncating Bakerloo Line services but there has been no basic change until 2015 other than to rolling stock and service patterns. As of 2015, plans and suggestions (from official bodies and others) connected to development of Crossrail and the Old Oak Common area have current potential consequences. If the Bakerloo Line is extended into South London, this must have an effect. Rumours are circulating as I write this, that this is being brought forward to 2029. This article in New Civil Engineer is entitled £775M Paddington Cube gets green light. It says that the development by Paddington station, will be designed to enhance the area and will upgrade the Bakerloo Line station. What will upgrades and extensions to the Bakerloo Line do to the Watford DC Line? I suspect there’s both scope for rationalisation, increased capacity and faster services, along both lines, with the correct design. There are other factors, that might create something special from an integrated Watford DC/Bakerloo Line. The Milton Keynes to East Croydon service might be increased in frequency and it might share the route. London Midland trains to Birmingham, Northampton and the Midlands could join the party. Train control and signalling is improving fast and might allow all these dissimilar services to share safely and give passengers better routes. Better train and station design could improve the terrible step-down and step-up access to Bakerloo Line trains at some stations. The Watford DC/Bakerloo Line could end up as another important North South route. 27 tph on the Bakerloo Line. Same platform interchange with trains for Birmingham, Euston, Milton Keynes, Northampton and many other places. Quality step-free interchange to Crossrail and main line services at Paddington. Improved step-free access to main line services at Charing Cross, Marylebone and Waterloo stations. An improved interchange with the Victoria and Central Lines at Oxford Circus station. Interchange with Thameslink at Elephant and Castle station. Interchange with the East London Line at New Cross Gate station. If all this happens by 2029, it won’t be soon enough! In posts like this one, entitled More Platform Action At Willesden Junction, I showed work to create a new bay platform 2 at Willesden Junction station. On Sunday, the 2nd Of October 2016, I took these pictures of the station in use. What are Transport for London’s plans for this platform, other than stock transfers and Rail Replacement Trains? As they were doing on that Sunday, they could run a Willesden Junction to Stratford service via a rebuilt Primrose Hill station. At some station to get in to and out of the Bakerloo Line 1972 Stock trains, is quite a step and it would be difficult in a wheel-chair. I have covered this in Platform Height Issues On The Watford DC Line and feel that dual-height platforms could be used. In some ways, Highbury and Islington station is the worst station in North London, as after war damage and then the addition of the Victoria, North London and East London Lines, it shows major evidence of Topsy at work. With better connections between the deep-level Victoria Line and Great Northern Metro and the London Overground, it could be a very useful interchange. At the moment, there’s just too much walking in long underground passageways. But as the Great Northern Metro will have new Class 717 trains giving a 10-12 tph link to Crossrail and the City at Moorgate, surely improvements at Highbury and Islington station would be worthwhile. These services will be going through the station in a few years. Admittedly, Crossrail will take some pressure off the station, by providing alternative routes via Moorgate and Stratford, but I can’t believe that Transport for London, aren’t looking to improve the interchange between the various lines. Especially, as with a few tweaks, Dear Old Vicky could possibly deliver forty tph or a train every ninety seconds, as opposed to the current hundred. These could include. A second entrance at Walthamstow Central station to provide step-free access and cope with the sheer numbers of passengers. A loop at Brixton, with a possible new station at Herne Hill to turn the trains at the Southern end. New trains with a higher performance. Improvements at certain busy stations like Oxford Circus, Euston and Kings Cross St. Pancras. Other improvements like air-conditioned trains would attract passengers to the line and make greater capacity necessary. This article on the authorative London Reconnections, which is entitled A Look At The World Class Capacity Upgrades, concludes its thoughts on the Victoria Line with this. With the Victoria line pushing towards what must be the theoretical limit for a line with that amount of rolling stock and – more importantly – two-platform termini, there are no plans to further improve the service. Indeed the challenge of procuring more trains and finding the depot space for them would probably discourage any such plans on its own. This does not mean that the line will be forgotten, as both Oxford Circus and Walthamstow Central are on TfL’s top ten hit list of stations in need of a major capacity upgrade. Simply that the days of pushing more trains through the same stations more quickly have passed. In the case of Walthamstow Central it is highly likely that the next step will be making the station double-ended, with an entrance near or in the shopping centre. I have a feeling that forty trains per hour will come sooner rather than later. In two sections of my ramblings, Oxford Circus station has had a small mention. An improved Oxford Circus station could benefit both the Bakerloo and Victoria Lines. As the station is high on TfL’s list of stations for improvement, I would expect to see something planned to start here before the mid 2020s. Better interchange between Victoria and Bakerloo Lines in different directions. More space around the Central Line. An underground pedestrian link to Crossrail at Bond Street station. Extra entrance and exits to serve pedestrianised Oxford and Regent Streets. I believe, that adding new passages, entrances, exits, lifts and escalators into the current complex can be organised in a similar way to how Bond Street station has been successfully upgraded over the last few years. Hopefully, Bank and Camden Town stations, will also be upgraded in the same way. But Oxford Circus is the big one! As I write this, the BBC is announcing that plans will be announced by Sadiq Khan today to bring the Bakerloo Line Upgrade forward to 2029. I think that this will bring forward a lot of related work to improve the Watford DC Line and the related lines across North London. The future is brown, with large splashes of orange!